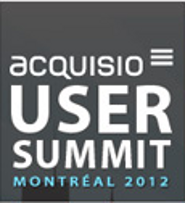 The Acquisio User Summit is quickly approaching. Our User Summit is intended specifically for users of our platform. We’ll have speakers who actually use the Acquisio platform giving seminars with real, actionable ways to increase your marketing success. We’re going to give you a chance to find out more about those parts of the platform you might not yet be familiar with. We’re also going to give you the opportunity to learn how to increase your ROI from the people who are doing it. They’ll tell you how. You’re going to leave the User Summit with information that you can begin implementing as soon as you get back to your desk, and materials that you can plug into the system to help your campaign growth immediately. And we’re going to buy you a drink or two, and show you around the city and… well, how about this? Here are the Top 10 reasons to attend the Acquisio User Summit. Reason #10: Jazz Fest: Stanley Clarke, Jack Bruce, Seal, Norah Jones, James Taylor, and a whole lot more will be in Montreal for the Montreal Jazz Fest. There are tons of free concerts and events, and it’s all happening just around the corner from the User Summit. Reason #9: Montreal! If you’ve never been to Montreal, here’s your excuse to get here. Great food, crazy nightlife, and friendly people will get you here, but once you experience it all, you may want to never leave. Reason #8: By demonstrating your interest in getting the most out of Acquisio, you’re showing your boss that you want to be the very best at what you do. What you learn here will pay off in the future for you, and for your long-term career goals. Reason #7: You will learn how to get the most out of your investment in Acquisio. You’re putting money into using the platform, and here’s your chance to learn how to get the most out of what you’re spending, and learn how to increase your business revenue. 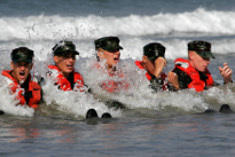 The training won’t be this hard, but you’ll be able to defend your campaigns like a Navy SEAL when you’re done! Reason #6: Get hands-on training from Acquisio experts that will turn you into a platform expert. You’ll get to chat one-on-one with experts who use our platform and get deeper insights into functionality. It’s good for you, and it’s great for your company. Reason #5: Mitch Joel: Our keynote speaker has been called “A Rock Star of Digital Marketing” by Marketing Magazine, and he’s also been called “one of North America’s leading digital visionaries.” If you haven’t seen him speak, it’s about time you did. Reason #4: Dual track session options geared to address the specific needs of users and executives. Reason #3: It’s not always about who you know; it’s about who you know who can help you meet your agency’s goals. With the best of the best in the biz at the Summit, it’s a great opportunity for you to meet a lot of people who can help you go even further. Reason #2: The sessions are all lead by actual Acquisio users and staff. Many years of digital marketing experience combined with an intimate knowledge of the Acquisio platform translate into success for you. And the #1 Reason to Attend the Acquisio User Summit: You will walk away with the skills and knowledge to leave the competition in your wake. With tools that you can put to use immediately at all levels of your business, you’ll have the skills you need to be the even better at what you do than you already are. We’re filling up quickly, and our special-rate rooms are almost sold out, so if you won’t to learn to get the most our of the Acquisio platform, you’ll want to book as soon as possible. Don’t forget, you only have until the end of April to take advantage of our half-price Early Bird Special. After that, you’ll be paying full price, so don’t delay, book your tickets today!